Home Family Law What is the Difference Between Pre-nuptial and Post-nuptial Agreements? What is the Difference Between Pre-nuptial and Post-nuptial Agreements? A prenuptial agreement is created before the marriage. It’s an agreement in which the couple decides how they will split their assets should the marriage ever come to an end. When both parties agree on a prenup, it can be an effortless process. A prenuptial agreement is beneficial because making these agreements ahead of time can save a lot of heartache, money, in the event of divorce. Prenup also help to detail financial distributions in the event of the death of a spouse. A prenuptial agreement must be accompanied by full financial disclosure. 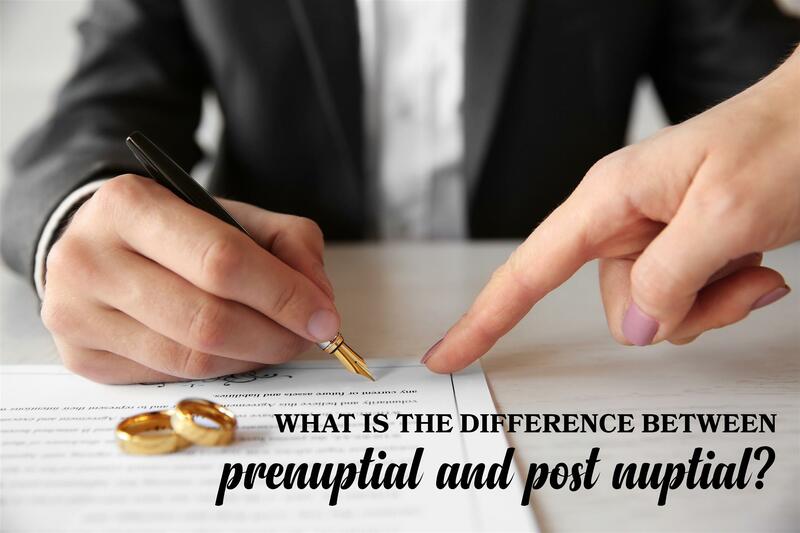 A post-nuptial agreement is very similar to a prenup with the major difference being that, the agreement is made after the wedding ceremony has taken place. It doesn’t have to be directly after the wedding, it can be made at any point during a marriage. In some cases, one of the spouses might have recently received a large inheritance or a gift and want to make claim it for themselves with no obligation to the other spouse and decides that a post-nup is the best way to do that. Postnuptial agreements require many of the same elements that prenuptial agreements do and that the agreement was entered into at will. With postnuptial agreements many of the assets that may have been acquired during the marriage have already become “marital,” and the agreement will have to address what’s going to happen with these already marital assets.